"What terms do you need to understand to buy the right music player for you? And which tools for downloading music will work best with your PC? Find out in our Buyer's Guide for Music Players. "To start, your best bet is an iPod . . . Apple's MP3 players are the easiest to use...."
"Automakers are expected to ride the popularity of the iPod and add support for Apple Computer's portable music player in millions of cars over the next six years, a research firm said Wednesday. "By 2011, the number of U.S. autos with iPod adapters is expected to reach 28 million from 500,000 this year, according to the Telematics Research Group. Worldwide, iPod support is expected in 73 million vehicles in six years from 900,000 this year." "Churches across Merseyside are using the latest technology to connect with their congregations. "The use of Internet downloads and podcasts has also encouraged more people to actually attend services, say church leaders. "The Bible is also available to buy as a 77-hour MP3 and the Vatican's own radio show is streamed on the Internet to download to music players. "The Rev Dr Shannon Ledbetter, of St Mary's Church in Knowsley Village, believes the iPod could revolutionise worshipping for the young and old alike. "Dr Ledbetter, 43, who appeared in the 1997 James Bond film, Tomorrow Never Dies, believes the technological breakthrough could be a 'godsend' for the housebound. "She said: 'For the elderly and housebound, this is a fantastic - all you need to do is fix them up with an iPod and they're good to go.'" "So, you're the lucky possessor of a new video iPod. "Just what are you going to use it for? Think about that one for a minute. "You could shell out $1.99 US to watch an old episode of Desperate Housewives on the small screen. And we are talking really SMALL screen here. "Just as nature abhors a vacuum, content providers hate a medium without a message. "And the good news is plenty are absolutely free, although sometimes it's easy to see why. "Here's a sample of what can be found on the web by those who want to keep the cost of stuffing their new video iPod to a minimum...."
"Without the global success of Apple's iPod, would these words carry the same value? And what is the importance of this phrase, globally, in the context of increasing concern regarding America's battle for competitive advantage as India and China raise their innovative profile and GDPs?" "We like hacks. We like when someone takes their Macintosh or Macintosh-related accessory, or just a bunch of parts really, and creates something new or unique out of it. We really like it when said hack is clean and looks professional or factory made. That's why we like the iMouse FM Transmitter that Make pointed us to this morning." PR: iTrip Auto, the newest addition to the iTrip lineup, is the most versatile iTrip to date, accommodating every dock connector iPod, including iPod nano and 5th Generation iPods with video. iTrip Auto combines Griffin's renowned FM transmitter technology with an integrated charger. Designed specifically for use in the car, iTrip Auto's large, easy-to-read backlit LCD screen affords quick, precise station selection and easy status at a glance. iTrip Auto uses the audio line out from the iPod's dock connector and optimizes the output volume. Speaker volume can be controlled solely from the car stereo controls, without having to adjust the iPod's volume level. iTrip Auto brings with it all the innovations of its iTrip lineage, including selectable LX and DX modes for best-quality audio under real-world conditions, US and International tuning modes, Griffin's RF technology, and the trademark Griffin world-class industrial design. PR: Sonnet Technologies has announced a new line of compact USB power adapters for 4th and 5th generation iPod models, iPod mini, iPod shuffle, and iPod nano. Sonnet's iPod USB Power Adapter is small, curvy, and versatile - it's about 2/3 the size of its competition - the blades fold away when not in use for easy travel storage, and its universal power compatibility enables worldwide use. Its non-polarized blades allow the adapter to be plugged in with the USB outlet face up or down, perfect for use in tight spots. With an MSRP of only US$19.95, it's a great value too - the included USB-to-dock connector cable is a $19 value alone! Sonnet's iPod USB Power Adapter is a simply fast way to charge an iPod without starting up a computer. Just plug in the adapter, and then connect the included cable between it and the iPod (iPod shuffle connects without the cable). "With each succeeding generation, the number of accessories bundled with iPod has been reduced, and the power adapter brick is no longer included," states Robert Farnsworth, Sonnet CEO. "Sonnet's USB power adapters offer iPod users an attractive and inexpensive choice for charging the device anywhere there's a power outlet." Farnsworth noted that the included cable may also be used with a computer, providing the user even more flexibility. At home or away, Sonnet USB power adapters let you love your iPod even longer! Sonnet's iPod USB Power Adapters (Part numbers IPOD-AC-CHG-W and IPOD-AC-CHG-B, for US, Canada, and Japan) are available immediately with an MSRP of USD $19.95. Sonnet will release iPod USB Power Adapters (Part numbers IPOD-AC-CHG-WE and IPOD-AC-CHG-BE) for the European market (excluding the UK) on January 3, 2006. Nearly identical to the US version, these adapters include Euro plugs that do not fold away. The i1030 Micro Case with Pelican's trademarked "Dual Band" design has a high impact polycarbonate shell that stands up to punishing conditions. The strong latch with stainless steel pins keeps the case closed after drops and hard knocks, and the shock-absorbing liner doubles as a watertight seal. Plus, the pressure-balancing Gore-Tex® valve keeps moisture out and makes it easier to open the case after altitude changes. The i1030 has a tough polycarbonate shell that stands up to extreme environments. The strong latch with stainless steel pins keeps the case closed after drops and hard knocks. The shock absorbing molded rubber liner doubles as a watertight seal. Plus, the automatic pressure release valve with one-way membrane equalizes air pressure at high altitudes and keeps water molecules out. The i1030 is available in white or yellow. As with all Pelican products, the i1030 Micro Case is backed by a Legendary Lifetime Guarantee of Excellence: "You break it we replace it . . . forever." Compatible with all iPod and iPod mini models. PR: You've never seen any iPod case like this before. Choose from relaxed styles that mix browns and suedes, and anything but basic black, to give your iPod a personality that's as individual as you are. The DLO Relaxed Leather designer cases come in suede and distressed leather styles that feature touches like contrast stitching and brass rivets. Styles range from the Snowflake to the Zig Zag stitch - six different designs for you to choose from. The Relaxed Leather cases each feature a protective flip-over cover with its own style and feel. The beautiful DLO Relaxed Leather cases are made from genuine rawhide that only gets softer and cooler looking as its worn and broken in. They feature a leather covered belt clip for an easy fit on your hip. The handy inside pocket will store ID, business cards or cash. The play-thru design offers access to all iPod controls, dock connector and headphone port. So get your leather on with DLO's new Relaxed Leather cases for iPod. Relaxed Leather cases as unique as you are. Unique. With the millions of iPod nanos in the world, it's getting harder to call your iPod nano special. Introducing the Relaxed Leather cases from DLO. Original designs that protect your iPod nano - from normalcy. The new Relaxed Leather Cases for iPod nano come in 10 different styles and are made from high-quality genuine leather. Each case has a specific design on its flip-up cover that sets it apart. Styles range from Suede and Antique Leather to Distressed Leather with Railroad Stitch and even a "Stingray" case. The Relaxed Leather cases each feature a protective flip-over cover with its own style and feel. The beautiful DLO Relaxed Leather cases for nano are made from genuine rawhide that only gets softer and cooler looking as its worn and broken in. They feature a leather covered belt clip for an easy fit on your hip. PR: After increasing media reports about the Apple iPod nano's susceptibility to scratches, Laserline introduced an iPod nano accessory that repels dust and scratches. Laserline's Silicone Skins are made of lightweight, high-grade, waterproof silicone elastomer that won't break, snap, tear, pill or split like rubber. as annoying fingerprints and scratches. The skins have an antistatic feature which repels the dust that can scratch and harm an iPod. Because the skins are waterproof, rain, snow or sweat are not problems, so users can take their music with them wherever they go in complete comfort and style. "This is a stylish and affordable way to protect your investment," says Jack Graham, vice president of sales for Laserline. "And we have Silicone Skins to fit all iPod models not just the nano." Apple iPod nanos are so portable they can be slipped into a shirt pocket or the small coin pocket of a user's jeans - but left unprotected, they are subject to annoying scratches that can distort the screen and impact their sleek look. The Laserline Silicone Skins are the perfect iPod nano accessory. Laserline Silicone skins for the Apple iPod nano are available in a variety of colors including: pale baby pink, icy blue, pearly white and not-so-basic black. Customers can also purchase the skins in convenient two-packs of white/black, pink/purple and blue/green. Five-packs of white, black, blue, green and pink are also available. Laserline Silicone skins are available online at iPod nano accessory skins for $14.99 and come with a free neck lanyard and wrist strap. PR: foneGear LLC has announced the product launch and forthcoming availability of tuneGear, a complete line of high-quality iPod and audio accessories, which will be on display at the 2006 International Consumer Electronics Show in Las Vegas, Nevada (Booth 35632). "tuneGear is a brand new concept in accessorizing the audio after-market," according to Jonathan Stein, foneGear's marketing manager. "We are the first company to develop and market a complete 'one-stop' approach to audio accessories - you can get everything from premium earbud headphones to charging solutions to FM radio transmitters to exquisite leather cases from tuneGear." The tuneGear line will be initially comprised of five main categories: headphones, charging solutions, carrying solutions, FM-radio transmitters, and "Music Experience Enhancements." Headphones will be available in several universally compatible varieties. All tuneGear headsets provide a high quality stereo listening experience, and include basic ear buds, "audio-foam" cushioned headsets with volume control, ear-clip sports ear buds with volume control, and premium ear buds with volume control, a lightweight aluminum housing, and high fidelity stereo sound. Premium ear buds produce deep bass through upgraded 14mm speakers. The tuneGear headphone line also includes versions of the premium ear buds included in lanyard holders for both Apple iPod® Shuffle® and iPod nano® music players. Charging solutions will initially cover the Apple iPod music players, the iPod mini®, and the iPod nano. Products include 12V vehicle chargers, retractable USB sync and charging cables, and home and away travel chargers. Also available for all covered models is a computer dock that allows the player to sync and charge with a computer while displaying the iPod upright. tuneGear carrying solutions include a wide range of products for a variety of players. tuneGear cases will be available in premium leather for in both clear-front pouch and protective cover flap versions for the Apple iPod music players, the iPod mini, and the iPod nano. 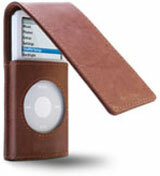 A premium leather case with a protective flap will also be available for the iPod Shuffle. 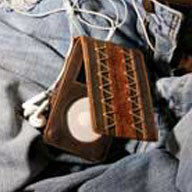 Durable tuneGear leather holsters will be available for the Apple iPod, the iPod mini, and the iPod nano. A universal armband kit will provide four holders in one package for carrying any iPod music player on an included elastic armband. Three FM-radio transmitters will initially be available from tuneGear. The '3-in-1' 12V transmitter is a vehicle cradle for the Apple iPod, the iPod mini, and the iPod nano, that allows users to play their iPod over their vehicle's FM radio, charge their iPod, and safely cradle it at a viewable angle. The '3-in-1' 12V transmitter for iPod Shuffle is a vehicle cradle for the Apple Shuffle player that allows users to play their iPod Shuffle over their vehicle's FM radio, charge their iPod, and safely cradle it while driving. The tuneGear battery-powered FM-radio transmitter is a universal device for any music player with a 3.5mm audio jack. It uses two AAA-sized batteries to transmit to any home or vehicle FM radio. Music Experience Enhancements include a range of products designed to increase the utility and fun factor of any music player. 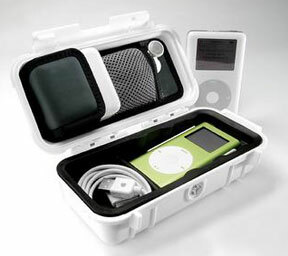 Available products will include dashboard sticky pads, signal splitters to allow multiple users to listen to the same player, and powerful, compact portable speakers that fold for travel and work easily with any iPod, MP3 player, notebook computer or CD player with 3.5mm audio jack to provide clear, room-filling sound. "To say we're excited about tuneGear is the understatement of the year," said Ken Eisenbraun, president of foneGear. "Our goal is to make tuneGear the one-stop brand for high-quality music accessories, and we are looking forward to beginning sales in January." The complete tuneGear line, which will be on sale in January 2006, will be on display along with the entire line of foneGear wireless phone accessories in Booth 35632 at the 2006 CES Show. PR: Rip to iPod rips each enabled (check-marked) CD track to iTunes and immediately copies it to your iPod, deletes the file, and removes the track from the iTunes library, giving the appearance of seamless CD-to-iPod importing. You can also change your encoder on-the-fly and your Preferences-set encoder will be restored after the rip. Works in OS 9 and OS X. Latest version allows you to select one of two or more loaded CDs, one of two or more mounted iPods. See the entry at . PR: iPod.iTunes allows you to sync your iPod to Apple's iTunes MP3 playing software. It copies your tracks and playlists from your iPod to iTunes. 8 synchronization modes in 2 directions (from iPod to iTunes and from iTunes to iPod). Simple one click synchronization (Screenshot). Option to choose songs manually if you don't want to synchronize them all. You can listen to songs before you choose to transfer them. Songs and playlist entries can be synchronized together or separately. If the songs on the iPod are already in the iTunes library and you only want the iPod playlists, you can use the playlist synchronization alone. With every song synchronization iPod.iTunes creates a date&time stamped playlist in iTunes containing the songs which were transferred. This gives the option to easily add those songs to existing playlists or to create new playlists from the transferred songs. Support for the iPod's "On The Go" playlist. Copies by default seamlessly to the iTunes music folder and creates a folder structure based on artist/album, as in iTunes (with options). File naming based on song number and song name, as in iTunes. File formats: MP3, AAC/MP4, Protected AAC (iTunes Music Store), Audible audio books, Podcasts, Apple Lossless, Video. iPod.iTunes can run directly from the iPod, so it's always there when you need it. Registration is independent of the computer. You can just connect your iPod to any Mac without registering every machine. Keep songs, videos and playlists on different Macs and iPods up to date. Do a full restore of songs, videos and playlists from iPod- i.e. after a hard disk failure or if you buy a new Mac. Transfer an iTunes library from one Mac to another via the iPod. Update a foreign iPod which is not linked to your iTunes library (without deleting content on it or touching the link). Update a linked iPod (without deleting content on it as iTunes' "auto update" does when tracks on the iPod are no longer in the iTunes library). Clone an iPod (see Help menu in iPod.iTunes). Mac/PC-formatted iPod with firmware 1.0 up to 6.0. Does currently not work with the iPod shuffle. Mac-formatted iPod with firmware 1.0 up to 1.2.2. Does not work with the iPod shuffle. iPod.iTunes is not free. If you like it, you can register here. iPod.iTunes can be tested without a registration to see it in action. The unregistered version skips about 50% of songs during synchronization (the exact rate depends on the contents on the iPod). When registering later, iPod.iTunes will transfer the rest of songs and/or playlists seamlessly to the iTunes library, without duplicates. fixed a bug found in 0.3.1 that iPodDisk.app couldn't be shared among accounts on a Mac when installed by the administrator. clean up temporary files and release resources upon exit. It's the same as nightly build 2005-12-21, so if you already have that build you don't need to download it again. PR: Pod2Go 1.6 has been released! Lyrics has been reworked completely, syncing has been heavily improved for Apps and News, multiple iPods can be handled more gracefully, News now imports feeds from other applications, Backup uses rsync to produce faster backups, Music correctly plays back videos from the new iPods with video, and much more! Pod2Go is also now a Universal Binary! The new iPods do not contain a file that Pod2Go reads to get the iPod's name - this was causing some issues with the Notes utility not showing, and the iPod menu not loading, resulting in no syncing. This has been fixed. If you hold down the Option key, the Sync menu in the iPod menu now becomes "Sync and Eject"
A big request for download timeouts has been implemented. Whenever a server went down, or the URL would take too long to download, Pod2Go would just hang, and you'd have to cancel the sync and start over. Now it just skips it and moves on after a few seconds. You can change the download timeout in the Preferences window. Mail has been completely reworked. No longer does it use AppleScript to communicate with Mail.app (which required Mail.app to be open). Now it reads from the same files Mail.app does, and is significantly faster (although the first sync will be slower). Syncing will be slightly faster when Mail is not open also. Also added an option "Flagged messages only". I've also implemented a new sync method for iCal. This new method is how it should have been done a long, long time ago. It doesn't use any AppleScripts, and works fast. With the new iPods (5G), you can have a photo displayed with any contact in full living color. This is to my knowledge the only other feature besides Videos that the new iPod has separate from the nano. If you don't have a 5G iPod, leave the option to display photos turned off, as it will keep the vCard file size down. Make sure in Address Book.app, under the vCard item in Preferences that you have the vCard version set to 3.0 if you want photo output. Fixed a bug where if you had no apps checked, but the sync before you had 1 or more, the notes wouldn't be deleted from your iPod. The entire interface and code has been reworked for 1.6 since 1.5. You can now easily download lyrics for your iTunes music (requires iTunes 5 or later) and then import those lyrics to your iPod (click the iPod button below or drag and drop), which sync as before like Notes or Contacts. There is also a button for clearing the lyrics of any selected songs. Be careful - when editing iTunes lyrics there is no undo of any kind! And Pod2Go will overwrite any lyrics without asking! Support for importing NetNewsWire feeds has been added. These will show up in the Sources window when you click the + button. You can also import any RSS or Atom feeds you have bookmarked in Safari (requires Safari 2.0+ for Tiger) too. The window for adding new feeds has been refreshed and reorganized. Backup now uses the rsync utility (built-in to Mac OS X) to do its backups. This is a much faster method, and the Backup syncs can now be canceled almost immediately. Instead of the 3-tabbed interface for adding text files, Text now uses a little pop up at the bottom. A bug has been fixed where some plain text files that weren't UTF-8 encoded weren't loading. Music has also been updated to correctly handle the playing of videos off the new 5G iPods, which appear in a new window and pause any music that you're currently playing in Pod2Go when played. Fixed a bug with audio files that change their album art (i.e. New Music Tuesday podcast). When playing these songs, the album art would show up in the top left corner of the screen. PR: iWriter allows users of all experience levels to take full advantage of the iPod Notes feature. iWriter is an extremely open-ended utility that has a wide array of uses ranging all the way from entertainment to education. By allowing users to create iPod projects with linked pages, iWriter helps you design and construct elaborate interactive text documents that effortlessly allow people to access endless varieties of information. You can preview your notes without the need to transfer to an iPod with iWriter's built in preview. iWriter lets you export your notes straight to the Notes folder of your iPod so there's no need to drag several files over via the file system. If keeping your notes on your iPod isn't good enough, then iWriter lets you export them as a website - using one of several themes - so that you can share your notes online with the rest of the world. PR: iStar Composer creates synchronized lyrics on the Mac to export to the iPod and iTunes. iStar Composer finds lyrics, but more importantly allows you to sync them to a song and then allows you to export the synchronized lyrics into a new music file (AAC) that will play/display in iTunes and on the iPod. Composers, Garage Band users, singers, song writers, recording studios and music publishers will all find that iStar Composer is a powerful tool to create, promote and enhance their music. Test out that new song with different lyrics. Export your latest songs with embedded lyrics that can be seen by others in iTunes and on the iPod. Rock, classical, jazz, opera, blues, country, and international music all benefit. Be understood not just heard. iStar Composer lets podcasters add extra detail to their podcasts. Now you can add extra information such as notes, translations and the names of guests. iStar Composer can even allow the hearing impaired to experience a podcast for the first time. iStar Composer is a great tool for education. Add notes to a professors lecture. Learn lines to a play or opera. Listen to foreign languages and immediately see the translation. iStar Composer is also great for creating nursery rhymes, find some music add the lyrics, export to iTunes. Bedtimes will never be the same. Downloadable music is very convenient but it has always been missing one thing that was available in the past and that is LYRICS! In the 60's and 70's records had lyrics on the back of the albums. In the 80's and 90's CD's had lyrics in the inserts. Downloadable music does not have lyrics. This loss is remedied by iStar Composer an original application that doesn't just add lyrics but makes synchronized lyrics available on the Mac, in iTunes and on the iPod. iStar Composer has some very original tools and techniques to line up the lyrics with the music. These tools make it easy to quickly add synchronized lyrics for any kind of song you own." iStar Composer can be used for editing and displaying lyrics, opera, karaoke, jokeoke (where people imitate a Robin Williams or another comedy routine), poetryoke (poems done to music), children's stories or children music, translation of text or lyrics, display of text for any audio track. And it is fun almost like playing a video game. Music, speeches, lectures, stories, in the future there will be examples you can download here. Feel free to contact and send us your compositions. iStar Composer is just beginning. We have many features and surprises on the way and we welcome your contributions. PR: Pod Comic Caster v 1.0 is designed to publish 320 x 240 Comics for 5th Generation iPods. Comic Caster is a QuickTime based action that speeds up the process in a few mouse clicks. Your End Product will be a QuickTime File that will run a page in a chosen slide duration. That will be sized and formatted to view on a video iPod. PR: LoadPod has launched a DVD movie loading service for users of the new Fifth Generation "video iPod" in eight major U.S. cities. LoadPod picks up the customer's video iPod and DVD collection at the customer's home or office, and returns the iPod fully loaded in a few days. Movies are encoded into 320x240 display format, ideal for the video iPod's screen, and take up an average of less than one gigabyte of iPod space apiece. iPod Movie Loading service is currently available in New York City, Chicago, Fort Lauderdale, Miami, Orlando, Philadelphia, San Francisco, and Seattle. LoadPod invented the iPod loading industry in early 2004 when it became the first and only nationwide service to load a customer's existing music CD collection into their iPod via in-person service. Today, LoadPod is proud to extend its services to include loading a customer's existing DVD movie collection into their video iPod. As with all LoadPod services, iPod Movie Loading requires no shipping, traveling, labor, or hassle on the part of the customer. Customers can place their iPod Movie Loading order starting today. PR: Wondering how to make the most of the new iPod - the one that plays movies and music videos? Looking for an easy way to get your movies into an iTunes-compatible format? Not sure how to get the best results from QuickTime Pro? Say howdy to your new Podner. Reformatting your movie collection into iPod-ready files is a cinch with Podner. And, it's up to six times faster than QuickTime Pro's Movie to iPod (320 x 240) option. Just drag your movie files to the Podner window, tweak the settings (if you want) then let Podner get to work. You can even set up a batch of dozens of files and simply walk away. Even if you're still waiting for your new iPod, or just want to use iTunes to manage your movies, you can get started now. Podner can reformat your movie files or just make them iTunes-compatible, but it doesn't require an iPod. It's even friendly with DivX and WMV files when the appropriate QuickTime components are installed. Sound difficult? Shoot us an email and we'll get back to you pronto with extra help. Splasm is known for its fast and friendly customer support. Download Podner and convert 2.5 minutes of any movies you have to view on your iPod or within iTunes. PR: iSquint is an iPod video conversion app. It's up to 5 times faster than Apple's method, works well with AVIs and MPEGs, and it's infinitely free-er. Drag in your file, click "Start", and away you go. You can even set screen-size and quality preferences. On a 1.5 GHz G4, iSquint can convert most video files to iPod-screen-sized videos in realtime. Depending on a few factors, a 20 minute video will take up anywhere from 50-150 MB of disk space. H.264 SUPPORT! ...and I mean it this time! H.264 gets the same 5 quality presets tailored for iPod compliance. TV-sized files that are iPod-resolution-kosher don't get resized while converting. I now rename all files to end in .m4v. Made some improvements to time-remaining estimations. Fixed some weird aspect-detection problems with some weird clips. Figured out the weird AppleScript number variable issue. Affected users are informed. There is no 0.9l. Sans-serif lowercase L is a wimpy, stupid letter. Imagine living in Illinois. Doesn't that look ridiculous? I deal with it every day. PR: podFlicks is a standalone application that will convert your movies into a format acceptable by the Fifth Generation iPods which have video playback capability (these iPods are also being referred to as the Wide iPod or Video iPods). No longer do you need to rely on QuickTime Pro and iTunes to get your video content onto your iPod. Just select your movie and click a button; podFlicks will prepare your movie and copy it to the iPod where you will be able to view the movie with a scroll and a click on the iPod. It just doesn't get any easier to get your movies from your Mac computer onto your Video iPod. Simply open the input movie, select the movie Destination, the Quality, the Destination iPod and click a button. podFlicks will convert the input movie to a local file on your hard drive, copy that file directly to your iPod and update the iPod's database so that the movie is viewable on it. After the conversion, simply eject your iPod, traverse to the Video: Movies menu, select your movie and click the iPod's Play button. It just does not get any easier than that! Select the Destination: iPod's Color Display or the Video Output. Select the Quality: Good, Better or Best. Select the iPod that you would like to copy the movie to. Click the Just Do It button. Drop a handful of unencrypted .VOB or .mpg files and/or folders containing unencrypted .VOB files or .mpg files (such as a VIDEO_TS folder on a DVD you made with iDVD), and all of them will be converted. You can drag the source files/folders even from a non-writable directory such as a mounted DVD volume. To use No Frills DVD2iPod, follow these steps. Most homemade DVDs will probably be formatted for TV (4:3). Wide screen and Extra wide screen format options are also available. 2. Customize the data rate settings. Use the slider or the text field if you want to customize the settings. Default data rate is automatically set when you select the proportions. If you want to customize these settings, you should do so after making a selection in the proportions area. 3. Choose destination for converted files. You can choose to select a destination when you click the Create button or simply let No Frills DVD2iPod put the converted files in the same locations as the source files. If you drag sources from locked destinations such as a DVD video disk while the Same as source choice selected, you will be prompted for a writable location when you click the Create button. 4. Drag source files and folders onto the picture in No Frills DVD2iPod's window. You can drag unencrypted .VOB or .mpg files and/or folders containing unencrypted .VOB files or .mpg files (such as a VIDEO_TS folder on a DVD you made with iDVD), even though other files are present in nested folders, and all of the appropriate files will be converted. The hierarchy of the dropped items will be reflected at the destination if you chose to select your specified location for converted files. 5. Click Create and wait. An activity indicator will appear and remain until the conversion(s) is finished, then a dialog will be displayed indicating that the operation has completed. You can click "OK" after receiving the "DONE!" notification and drag more items to begin a new conversion process. If you installed version 1.x of No Frills DVD2iPod, you can run the Remove obsolete support items application to get rid of items previously installed but no longer needed by No Frills DVD2iPod. Using 0SEx to combine .VOB files. 0SEx is a tool that extracts video files from DVD disks. While it can be used in some cases to decrypt protected video files, it's most useful with No Frills DVD2iPod to combine several .VOB files so that selected content can be combined and converted to a single video file then transferred to an iPod using iTunes. 0SEx's default setting for gathering and combining the files is precisely the setting you need. You simply have to select which titles, chapters, and audio content are combined into the resulting .VOB file created by 0SEx. If two copies of the same title with different screen formatting are available in 0SEx, You should probably use the one for full screen (4:3) viewing size. You can select some chapters and begin the extraction, then stop 0SEx and view the partially extracted file with VLC to see if you're selecting the right content. If you prefer, you can convert the .VOB files separately using No Frills DVD2iPod and add them in the correct order to an iTunes playlist. The iPod will continue playing each item in the playlist although there will usually be a brief pause when switching between files. No Frills DVD2iPod is simple freeware.